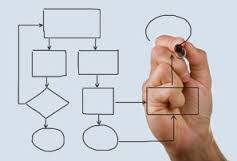 Processes are one of the most important factors in the day-to-day operations of any successful organization. Continual process improvement is a must in today’s ever-improving, customer- focused, quality-driven environment. Processes can be formal or informal. Formal processes – often referred to as procedures or work instructions – are documented, and typically have well-established steps. For example, you might have various procedures for receiving and submitting invoices, applying a sealing to a particular manufactured part or for creating and establishing relationships with new clients. Ensuring employees perform these tasks according to the prescribed procedures provides standardization and ultimately increased customer satisfaction. When everyone in the organization follows a well-tested set of procedures or work instructions, typically there are fewer errors and delays, there is less duplicated effort, and staff and customers feel more satisfied. Processes that do not meet your expectations, or more importantly the expectations of your customers usually lead to numerous problems. Customers will complain about poor product quality or bad service. Work is typically performed in many different ways – typically, not according to your prescribed standard. Bottlenecks develop causing increased costs and timely delays. Once you’ve decided what process needs to be improved, you will need to document the actual work tasks that are to be performed. This involves utilizing process mapping techniques. These techniques show the steps in the process visually. This allows the improvement team to review the existing process and analyze it for weaknesses and potential improvements. It’s important to explore each phase in detail, as some processes may contain informal sub-steps that you’re not aware of. Employees involved in the process should be consulted to ensure that nothing important is overlooked. Using the documented process map, a detailed analysis of the process under review takes place. The analysis includes a review of the existing process based performance metrics related to quality, cost and time. The focus of the analysis is to develop an understanding of the level of existing performance as well as to why the process in not performing according to expectations. Once the analysis is completed and the improvement team understands the existing limitations and weaknesses of the process, a re-design of the process takes place. In the phase, the uncovered problems that were identified are permanently fixed. New ways to perform the work are reviewed and scrutinized. A new process map is created that demonstrates the ability of the new process to meet the performance expectations of management. The new process map is completed and approved by management for implementation. This is the step in the process that many process initiatives fail. Implementation and execution is much more difficult than creating and planning for the new process. Once the new process has been implemented and operating for a period of time, it needs to be measured to ensure it is performing according to the new performance metrics. Process based measurements need to be put in place to ensure the new process is providing a standard output that meets the expectations of cost, quality and time. Click here to contact Workplace One to learn more about how we can help your business improve.